Marcial Bautista Valle, president of the Organization of Ecologist Campesinos of the Sierra de Petatlán (OCESP), and Eva Alarcón Ortiz, assessor of this organization, were taken by a commando-team on 7 December in the region of the Costa Grande of Guerrero. They had been traveling on a bus that was held up by armed subjects who took them by force. Federal and state forces that make up the Coordination Guerrero group, which is comprised of military authorities and representatives from the thee levels of government who are in charge of analyzing questions of security, chose to carry out a joint operation to find the two but have not been successful to date. 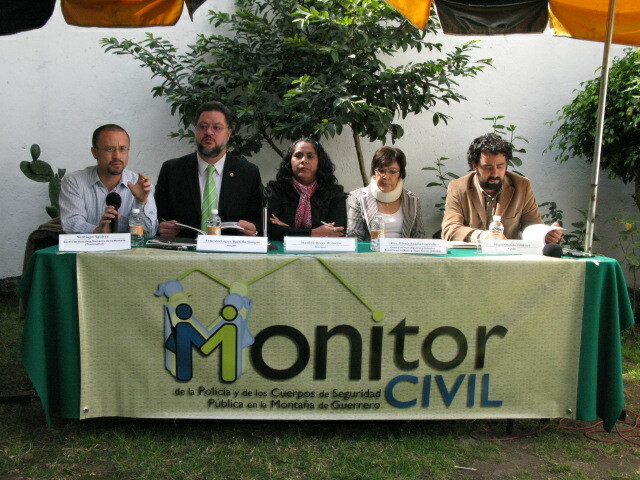 Informe completo del Monitor Civil de la Policía en la Montaña de Guerrero (7 December 2011). This entry was posted on Wednesday, December 14th, 2011 at 1:31 pm and is filed under Disappeared, Guerrero, Human Rights, Human Rights Defenders, Indigenous people, Justice system, Land and Territory, Land rights, Militarization, Paramilitary, Political Prisoners/Prisoner of Conscience, Women. You can follow any responses to this entry through the RSS 2.0 feed. You can leave a response, or trackback from your own site.